Rockhopper penguins in Santa Cruz, Argentina. The punk-rock penguins of Argentina are gaining a new marine protected area, part of an agreement sought by the Wildlife Conservation Society to protect a million acres of seascape and the unique creatures who call it home. 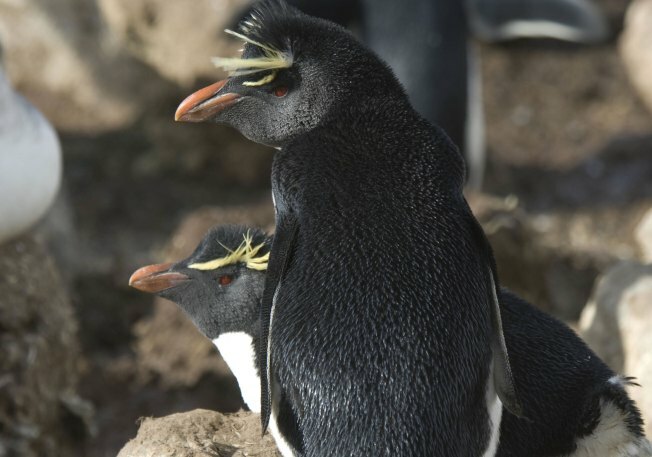 The Bronx-based WCS said Wednesday that the new "Penguin Island Marine Park" in Argentina's southern province of Santa Cruz will safeguard 650 square miles of coastline, which is home to the country's only colony of rockhopper penguins. Rockhopper penguins -- who true to their name bounce from rock to rock -- are sometimes described as "punk rock" penguins because of their spiked plumes, bright yellow "eyebrows" and pink feet. The global population of Southern rockhoppers has fallen sharply by about one-third in the last thirty years to roughly one million pairs, WCS said. Currently, the species is classified as “vulnerable” by the International Union for the Conservation of Nature. Their counterparts in the Indian and Atlantic Oceans, the Northern rockhopper, are classified as endangered. In addition to Argentina, colonies of the southern rockhopper are found in Antarctica and the Falkland Islands. While Argentina’s coastline is largely undeveloped, its wildlife is threatened by pollution caused by offshore oil drilling and transport, and by entanglement in nets used by commercial fishing fleets, WCS said. The park’s creation represents a joint effort by the WCS and the Government of Santa Cruz and Argentina’s National Parks Service. “This decision by Argentine officials represents a significant commitment by the government to protect an extraordinary marine ecosystem,” said Director of the Wildlife Conservation Society’s Latin American Programs Avecita Chicchon. “The creation of this park will help to ensure a future for the this threatened species in this region and will protect the area's unique natural heritage."